As I sit and watch Barca take City apart at will, I begin to think that Tuesday night’s result was not the worst thing that could have happened to us. Yes, as is becoming all too familiar in the Champion’s League, we were agonizingly close, just one goal away… but even if we had got through, the team is still one player away from being genuine contenders in this competition. Don’t get me wrong, I don’t think we are that far away, literally just one or maybe two new complementary players and we will be able to mix it with any team. So now we are out of a competition we would have most definitely struggled to win, we can focus on the two competitions we are still in, securing an automatic qualification for next year’s Champion’s League, and retaining the FA Cup. The latter meaning we eclipse Man U and become the team to have won the FA cup the most times and with the most successful manager in the competition. Progress, acceptable progress, and with some good business in the summer we can increase the scope of what we can expect to achieve. 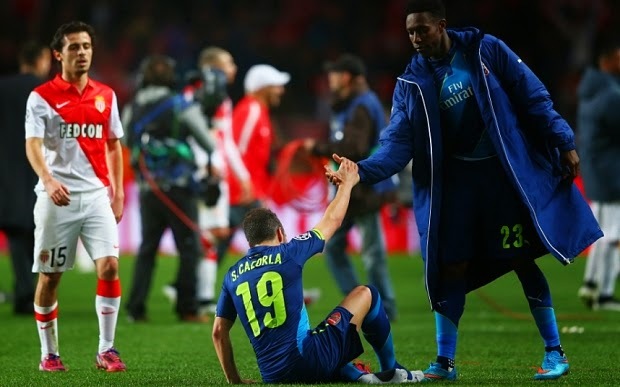 I truly believe that this was one of, if not the best all round performances from the Arsenal this season. I would challenge anyone to present a game where we have played better as a team throughout the field. Right from the get go we were moving the ball well and extremely quickly through their tight ranks. The combination play in attack was mesmerizing, particularly from Ozil, Sanchez, Welbeck and Cazorla, who all looked world class! The one thing I did notice about Danny, however, was that when he is running at full clip, unlike the other three, he does struggle to keep the ball in close control. I will say though, I have never seen such speed from him, or Monreal, as I saw last night. Both rapid! Giroud was also solid with several shots on target and one very very composed goal (on his right no less). The reaction from him and the team was great. We watched the first half in a bar that refused to put the sound on, instead subjecting us to rather annoying yet jolly Irish music (quite surreal actually). We could not tell for sure that we had scored from the reactions alone, and wouldn’t let ourselves believe it until we saw it displayed in the corner of the screen. Very professional performance throughout. Stretching back to the Man U game, the boss has been spot on with his subs and tactics. Again last night he had it spot on, Monaco were just about able to hold on and stifle us. In the moment, I questioned the decision to switch Coquelin for Rambo so early on, thinking it would leave the defense too exposed to the counter, particularly with the pace Monaco had on the field. However, his proactive approach not was not only fruitful in the shape of a goal from Rambo, but the defense still managed to stifle the Monaco attack, not allowing a single shot on goal all game. A final word for Rambo, who looked really good again, grabbing his second goal in as many games. Let’s hope this form continues and he starts to resemble the player he was last season. Newcastle on Saturday, with a victory we will extend our winning run in the prem to six.